I have 17 years (1995 to 2011) of death certificate data related to suicide deaths for a state in the U.S. There is a lot of mythology out there about suicides and the months/seasons, much of it contradictory, and of the literature I've reviewed, I do not get a clear sense of methods used or confidence in results. So I've set out to see if I can determine whether suicides are more or less likely to occur in any given month within my data set. All of my analyses are done in R.
The total number of suicides in the data is 13,909. If you look at the year with the fewest suicides, they occur on 309/365 days (85%). If you look at the year with the most suicides, they occur on 339/365 days (93%). So there are a fair number of days each year without suicides. However, when aggregated across all 17 years, there are suicides on every day of the year, including February 29 (although only 5 when the average is 38). 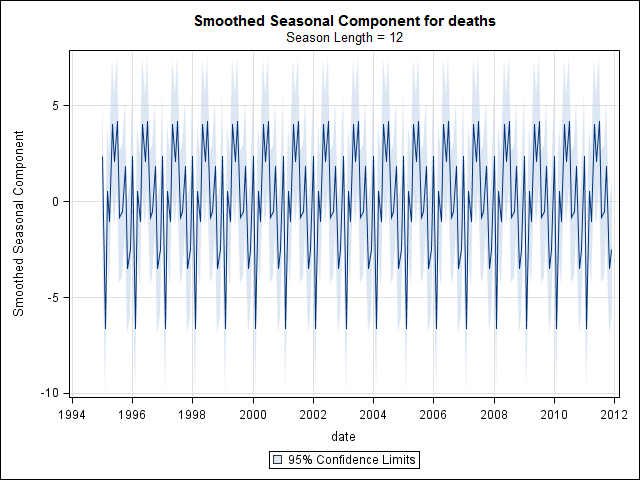 Simply adding up the number of suicides on each day of the year doesn't indicate a clear seasonality (to my eye). My first approach was to aggregate the data set by month for all years and do a chi-square test after computing the expected probabilities for the null hypothesis, that there was no systematic variance in suicide counts by month. I computed the probabilities for each month taking into account the number of days (and adjusting February for leap years). # So does the sample match  expected values? The image below indicates total counts per month. The horizontal red lines are positioned at the expected values for February, 30 day months, and 31 day months respectively. Consistent with the chi-square test, no month is outside the 95% confidence interval for expected counts. 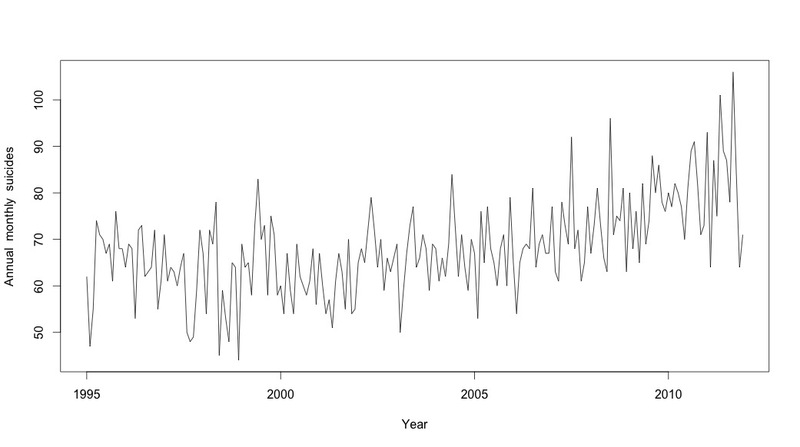 I thought I was done until I started to investigate time series data. As I imagine many people do, I started with the non-parametric seasonal decomposition method using the stl function in the stats package. 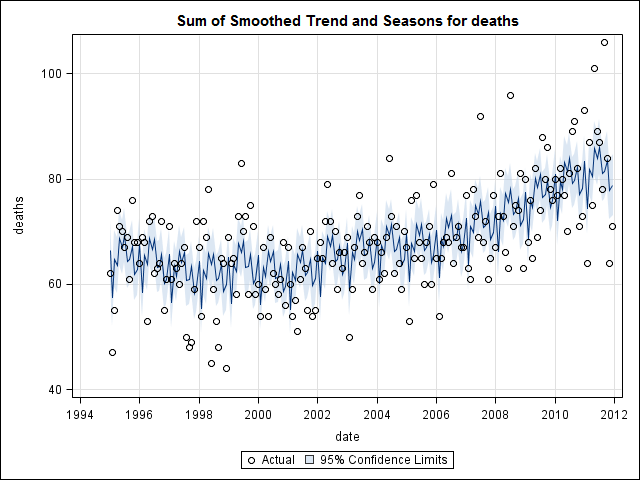 # Plot the monthly suicide count, note the trend, but seasonality? At this point I became concerned because it appears to me that there is both a seasonal component and a trend. After much internet research I decided to follow the instructions of Rob Hyndman and George Athana­sopou­los as laid out in their on-line text "Forecasting: principles and practice", specifically to apply a seasonal ARIMA model. I used adf.test() and kpss.test() to assess for stationarity and got conflicting results. They both rejected the null hypothesis (noting that they test the opposite hypothesis). I then used the algorithm in the book to see if I could determine the amount of differencing that needed to be done for both the trend and season. I ended with nd = 1, ns = 0. I then ran auto.arima, which chose a model that had both a trend and a seasonal component along with a "drift" type constant. 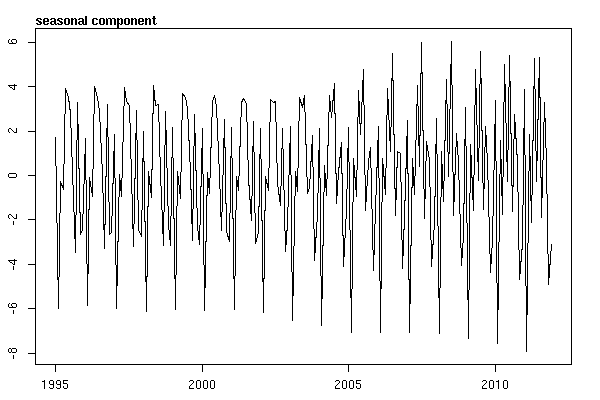 Finally, I looked at the residuals from the fit and if I understand this correctly, since all values are within the threshold limits, they are behaving like white noise and thus the model is fairly reasonable. I ran a portmanteau test as described in the text, which had a p value well above 0.05, but I'm not sure that I have the parameters correct. Having gone back and read the chapter on arima modeling again, I realize now that auto.arima did choose to model trend and season. And I'm also realizing that forecasting is not specifically the analysis I should probably be doing. I want to know if a specific month (or more generally time of year) should be flagged as a high risk month. It seems that the tools in the forecasting literature are highly pertinent, but perhaps not the best for my question. Any and all input is much appreciated. Count is the number of suicides that happened on that day. "t" is a numeric sequence from 1 to the total number of days in the table (5533). I've taken note of comments below and thought about two things related to modeling suicide and seasons. First, with respect to my question, months are simply proxies for marking change of season, I am not interested in wether or not a particular month is different from others (that of course is an interesting question, but it's not what I set out to investigate). Hence, I think it makes sense to equalize the months by simply using the first 28 days of all months. 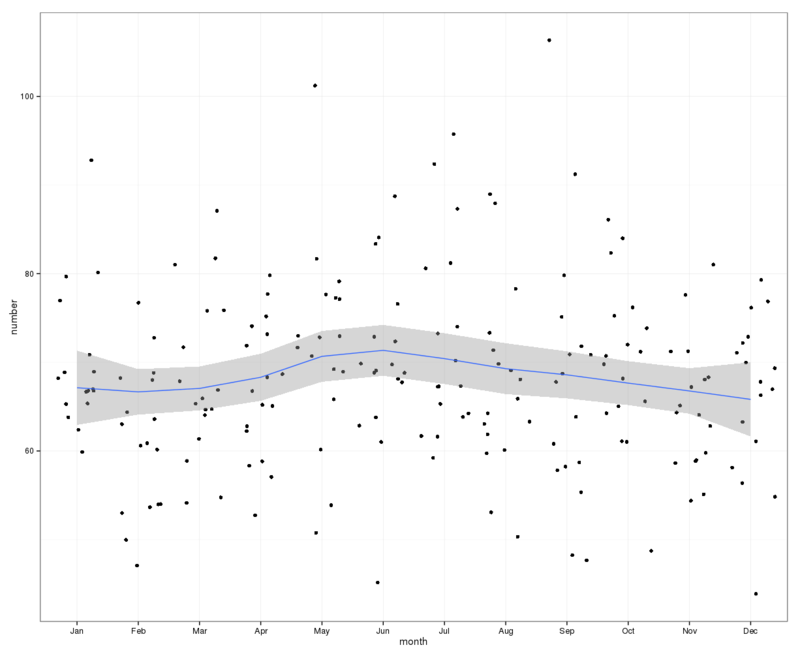 When you do this, you get a slightly worse fit, which I am interpreting as more evidence towards a lack of seasonality. 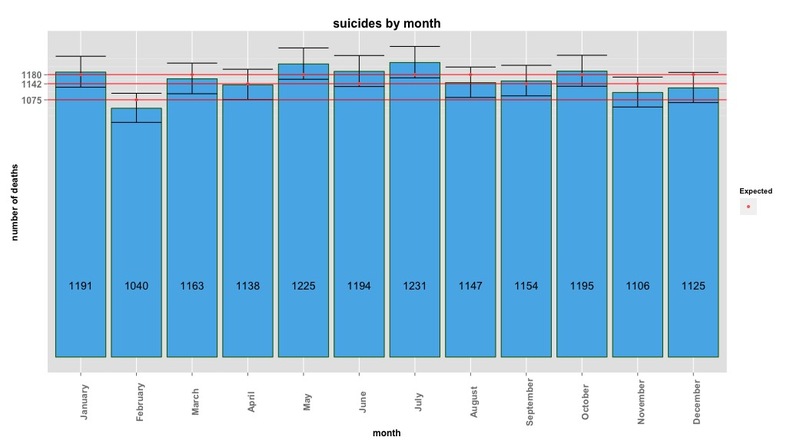 In the output below, the first fit is a reproduction from an answer below using months with their true number of days, followed by a data set suicideByShortMonth in which suicide counts were computed from the first 28 days of all months. I'm interested in what people think about wether or not this adjustment is a good idea, not necessary, or harmful? The second thing I've looked into more is the issue of using month as a proxy for season. Perhaps a better indicator of season is the number of daylight hours an area receives. This data comes from a northern state that has substantial variation in daylight. 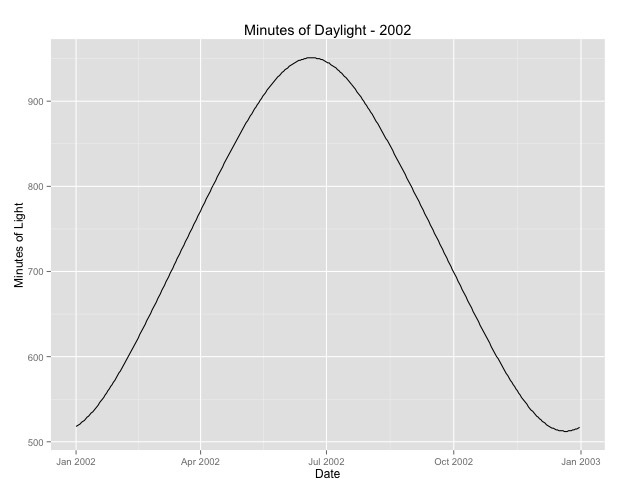 Below is a graph of the daylight from the year 2002. When I use this data rather than month of the year, the effect is still significant, but the effect is very, very small. The residual deviance is much larger than the models above. If daylight hours is a better model for seasons, and the fit is not as good, is this more evidence of very small seasonal effect? I'm posting the daylight hours in case anyone wants to play around with this. Note, this is not a leap year, so if you want to put in the minutes for the leap years, either extrapolate or retrieve the data. What about a Poisson regression? I created a data frame containing your data, plus an index t for the time (in months) and a variable monthdays for the number of days in each month. Well, of course the monthdays effect vanishes; it can be estimated only thanks to leap years!! Keeping it in the model (and taking into account leap years) allows to use the residual deviances to compare the two models. A chi-square test is a good approach as a preliminary view to your question. 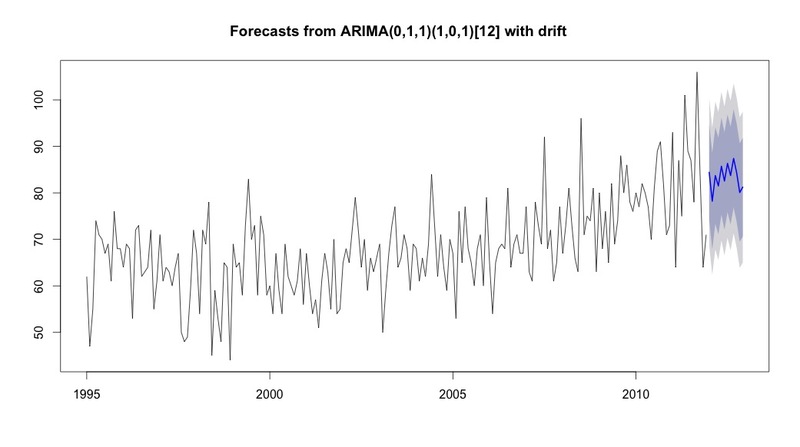 Looking at the orders chosen by an automatic ARIMA model selection procedure is also a bit risky since a seasonal ARIMA model does not always involve seasonality (for details see this discussion). In this case, the chosen model generates seasonal cycles and the comment by @RichardHardy is reasonable, however, a further insight is required in order to conclude that suicides are driven by a seasonal pattern. A similar component was extracted using the software TRAMO-SEATS with default options. We can see that the estimated seasonal pattern is not stable across time and, hence, does not support the hypothesis of a recurrent pattern in the number of suicides across months during the sample period. Running the software X-13ARIMA-SEATS with default options, the combined test for seasonality concluded that identifiable seasonality is not present. Edit (see this answer and my comment below for a definition of identifiable seasonality). Given the nature of your data, it would be worth complementing this analysis based on time series methods with a model for count data (e.g. Poisson model) and test for the significance of seasonality in that model. Adding the tag count-data to your question may result in more views and potential answers in this direction. on this problem to understand "why" there would be seasonality to supplement data analysis. Coming to the data, I used an excellent decomposition method called unobserved components model (UCM) which is a form of state space method. See also this very accessible article by Koopman. My approach is similar to @Javlacalle. It not only provides a tool to decompose time series data but also objectively assesses the presence or absence of seasonality via significance testing. I'm not a big fan of significance testing on non-experimental data but I don't know of any other procedure that you would be able to test your hypothesis on presence/absence of seasonality on a time series data. 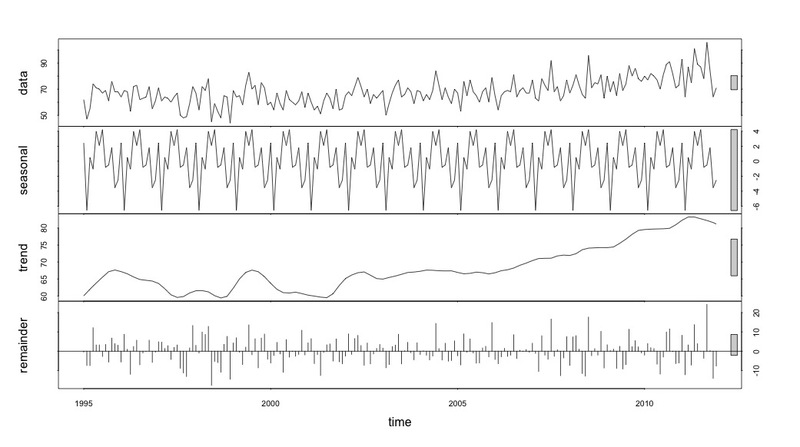 Time Series Data = level + Slope + Seasonality + Cycle + Causal + Error(Noise). You could also test if level, slope, cycle is deterministic or stochastic. Please note that level + slope = trend. Below I present some analysis on your data using UCM. I used SAS to do the analysis. There is a stochastic level + deterministic seasonality + some outliers and the data does not have any other detectable features. Below is significance analysis of various components. Notice that I used trigonometry (that is sin/cos in the seasonality statement in PROC UCM) similar to @Elvis and @Nick Cox. You could also use dummy coding in UCM and when I tested both gave similar results. 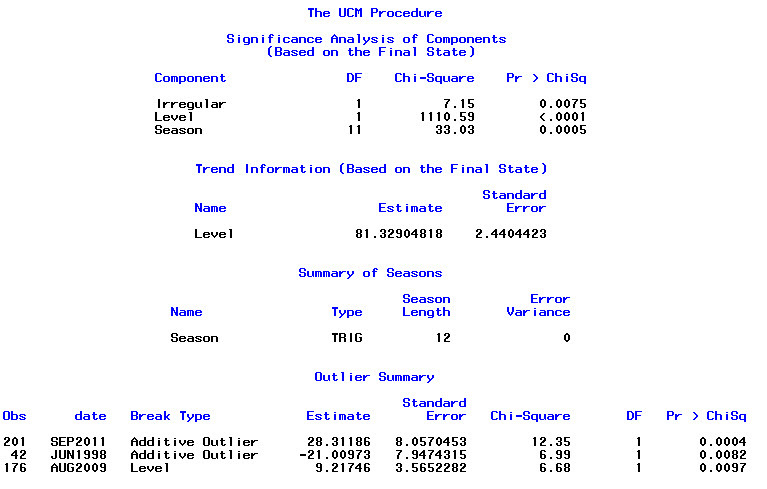 See this documentation for differences between the two ways to model seasonality in SAS. As shown above you have outliers: two pulses and one level shift in 2009 (Did economy/housing bubble play a role after 2009 ??) which could be explained by further deep dive analysis. A good feature of using Proc UCM is that it provides excellent graphical output. Below is seasonality and a combined trend and seasonality plot. Whatever is left over is noise. 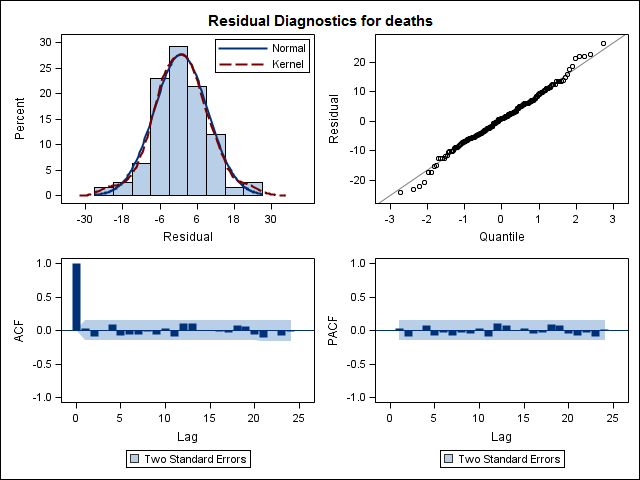 A more important diagnostic test if you want to use p values and significance testing is to check if your residuals are pattern-less and normally distributed which is satisfied in the above model using UCM and as shown below in the residual diagnostic plots like acf/pacf and others. Conclusion: Based on data analysis using UCM and significance testing the data appears to have seasonality and we see high number of deaths in summer months of May/June/July and lowest in winter months of December and February. Additional Considerations: Please also consider the practical significance of the magnitude of seasonal variation. To negate counterfactual arguments please consult domain experts to further complement and validate your hypothesis. I'm by no means saying that this is the only approach to solve this problem. The feature that I like about UCM is that it allows you to explicitly model all the time series features and is highly visual as well. For initial visual estimation, following graph can be used. Plotting the monthly data with loess curve and its 95% confidence interval, it appears that there is a mid-year rise peaking at June. Other factors may be causing the data to have wide distribution, hence the seasonal trend may be getting masked in this raw data loess plot. The data points have been jittered. This also shows that during the months in first half of the year, the number of cases keep rising, while they are falling in the second half of the year. This also suggest a peak in mid-year. However, the confidence intervals are wide and goes across 0, i.e. 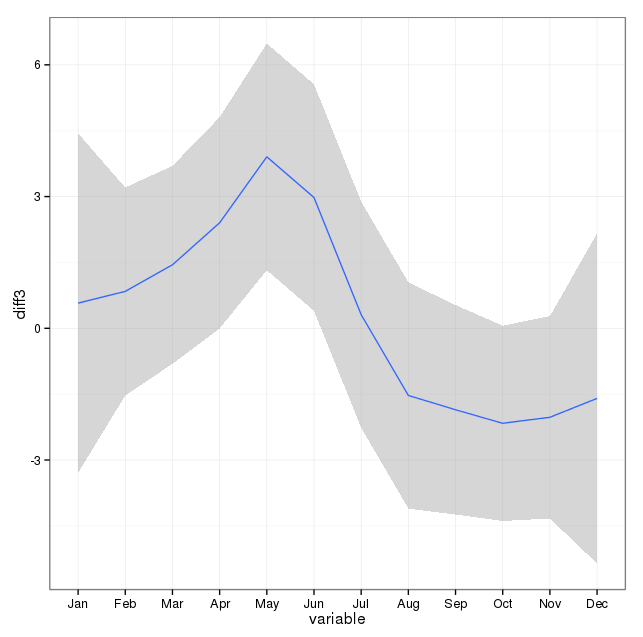 no change, throughout the year, indicating a lack of statistical significance. This shows a clear increase in numbers in May and a fall in October. Not the answer you're looking for? Browse other questions tagged r chi-squared arima count-data seasonality or ask your own question. 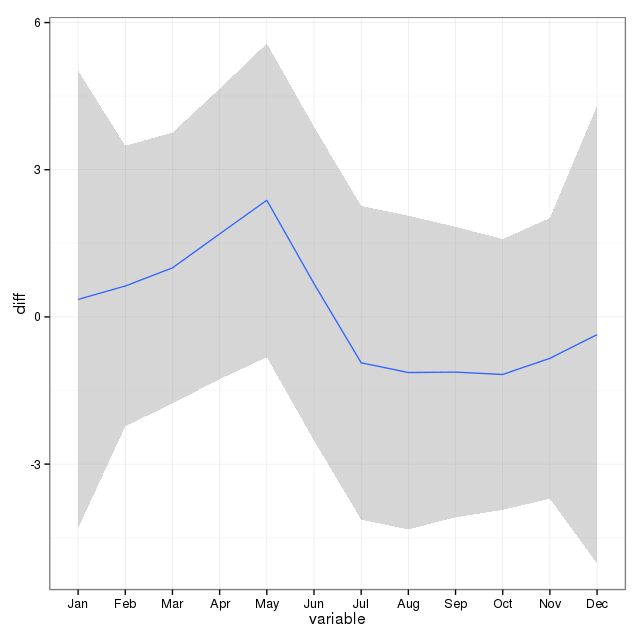 What does “identifiable seasonality” mean in X11 documentation? How to determine seasonality of a binary variable? How does this capture seasonality? Count Data - Gaussian, poisson or quasipoisson?